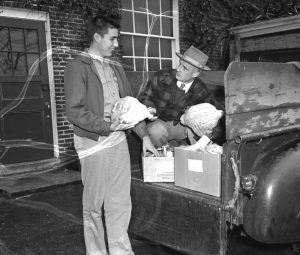 1956: Principal Rutherford M. Drummond of Falmouth High School, right, turned deliveryman to aid the Future Homemakers of the school in providing Thanksgiving baskets for the needy of the town. He is aided by Brian Farwell, a senior, Pupils packed the baskets and Drummond and Mrs. Mary Conroy, home economics teacher, delivered them to protect the identity of the recipients. 84801A	PH 22 Nov 1956 : Principal Rutherford M. Drummond of Falmouth High School, right, turned deliveryman to aid the Future Homemakers of the school in providing Thanksgiving baskets for the needy of the town. He is aided by Brian Farwell, a senior, Pupils packed the baskets and Drummond and Mrs. Mary Conroy, home economics teacher, delivered them to protect the identity of the recipients.